A very important component of the Arval Garden is surely the Moon's Flowerbed about which it's interesting to provide some detail even in consideration of the current period of the year. 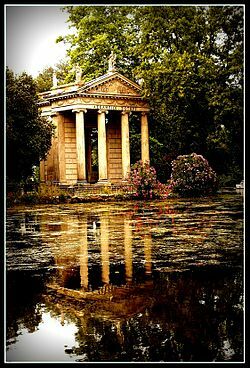 The importance of the Moon's flowerbed results from many factors (very difficult to describe here in detail): one of these is the strict relation between this flowerbed and Diana in her deeper, arcane, iniziation and hermetic meaning. Moreover this flowerbed expresses, in "green terms", all the power of the Feminine Force. The Moon's flowerbed describes the sacred generating and reproductive force: in this flowerbed the generating force of the seeds, the Force of the Nature, giving life and shape to all the being and fruits, are simbolically and directly represented. 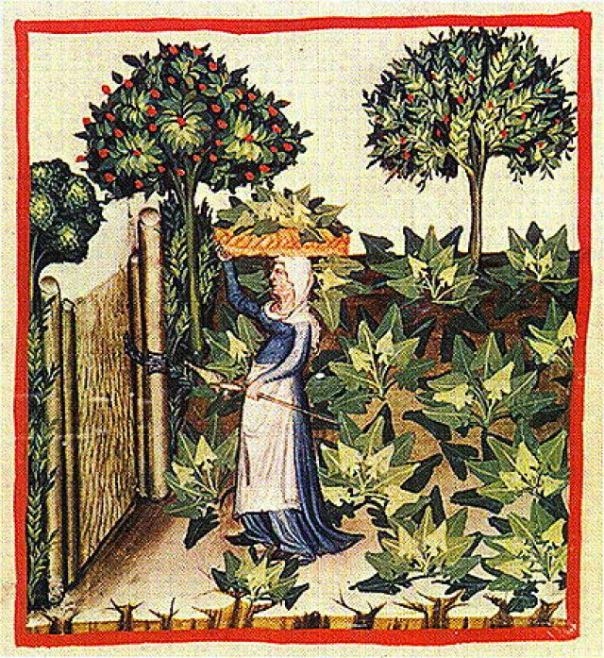 The general knowledge of herbs, plants and trees, and their properties, is directly connected to the Moon and to Diana: since the very ancient times, a real "Green Religion", a kind of superior Magic, strictly linked to the cult of Diana and the Moon, was developed. The main focus of this peculiar religion is the possibility to develop an arcane capability to manage the feminine energy inherent to the green world, plants, herbs, trees which are always feminine beings (like the Ninphae or the Elfs). Therefore, women, but not exclusively, have played a preminent role within this Sacred Feminine Knowledge. The Arval Sisters are thus directly involved in this Science (which in the past was connected to the idea of the witch with the related tragic consequences). The Arval Brothers must give great evidence to their inner feminine force in order to fully enter this Great Sacred Knwoledge. In this flowerbed the main Lunar Plants, sacred to Diana are placed. These herbs, like the Force of Diana, provide on the one hand relief, being soporific, relaxing, sedative. On the other hnad they can increase ncontrolled divination capabilities driving one to madness ("lunacy") also provoking nervous umbalances with hallucinations and nightmares (consider also the origin of this term...). As on the case of the Solar Herbs, the use of the Lunar and night herbs implies a deep arval knowledge. I recommend the profane people not to try to make experiments with these herbs. the myrrh - it is used to produce sacred oils and fragrances beloved to Gods, Goddesses, Lares, Penates and Manes. Una componente molto importante dell'Horto Arvalico è senza dubbio l'Aiuola della Luna, su cui è interessante fornire qualche dettaglio in considerazione del periodo dell'anno in cui ci troviamo. L'Aiuola della Luna è molto importante anche perchè, oltre ad essere connessa a Diana nel suo significato più profondo, arcano, iniziatico ed ermetico, esprime tutta la potenza dell'Energia Femminile. Questa aiuola infatti descrive la forza della generazione e riproduzione. In questa aiuola si manifesta la forza generativa del seme, la forza della Natura che dà la forma ai viventi e che genera i frutti. La conoscenza generale delle piante e delle loro proprietà è intimamente connessa alla Luna e a Diana, tanto che si è sviluppata, sin dai tempi più antichi, una vera e propria "Religione Verde", una forma di Magia Superiore, legata profondamente al Culto di Diana e della Luna. Poichè si tratta di maneggiare un'energia femminile, connessa alle piante - che, insieme a tutti gli alberi e le relative infe (o Elfi), sono sempre di genere femminile - le donne, ma non esclusivamente, hanno avuto sempre un ruolo eminente all'interno di questo Sapere, di questa "Conoscenza Sacra". Le Sorelle Arvali sono quindi coinvolte in prima persona in questa Scienza (che in passato le ha associate alla figura della "strega", con tutte le tragiche conseguenze del caso): i Fratelli Arvali devono pertanto operare ed agire sulla forza femminile presente in loro stessi per poter accedere a pieno a questa Conoscenza Sacra. In questa aiuola trovano posto tutte le principali piante lunari, sacre a Diana. Sono piante che, come la stessa forza di Diana, da una parte sono lenitive, soporifere, calmanti, sedative, ma dall'altra possono accentuare le capacità divinatorie (fino a portare alla follia) o comunque esaltare lo squilibrio nervoso (fino a portare alle allucinazioni ed incubi). Come nel caso quindi delle piante solari, l'uso delle pianti lunari e notturne prevede una profonda conoscenza arvalica. Si sconsiglia pertanto ai profani di fare esperimenti con tali piante. "Asciugarsi nel Sole, Bagnarsi nella Luna"
"Dry yourself in the Sun, get wet yourself in the Moon"
In questa breve frase viene concentrata tutta la simbologia esoterica e misterica connessa a queste due polarità. Chiunque abbia una anche minima dimestichezza con la Spiritualità Tradizionale Romana comprenderà agilmente il significato più profondo celato in queste magnifiche parole. In this short sentence all the esoteric and mystery symbology related to these polarities is briefly resumed. Everyone having even a minimal familiarity with the Traditional Roman Spirituality will easily understand the deeper meaning and sense hidden inside these beautiful words. Through these words, Marsilio Ficino (1433-1499) donated us this beautiful Orphic Hymn. Ficino, a man of the Renaissance and great expert of Ars Regia, of course doesn't describe the Moon as Earth's satellite or astronomical object but rather as metaphysical entity having great symbolic and religious importance and value. As I have already superficially mentioned with regards to the Sun, the same it can be said about the Moon thus having an antique theology and theurgy. While July is entirely biased on the Sun (Apollo), August is totally focused on the Moon (Diana) and on her extremely complex and deep symbology and meaning. It's very difficult to provide here adequate explanations about this Lunar theology and theurgy (and after all I have a rather limited knowledge about it), but in my opinion some brief indications (even if very superficial) can be useful to better understand on the one hand the role of the Moon in the Traditional Roman Spirituality and on the other hand some implications, meaning and value of the Cult of Diana, focus of this important month in the sacred calendar. I believe that a Cultor/Cultrix should have even a minimal knowledge about this complex issue as well as that related to the Sun: any further detail can be obtained contacting an Augur (who by definition has a sound expertize about these topics - surely better than mine). 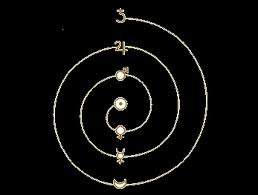 The Moon is part of the Foundamental Duality (Sun - Moon) deriving from the Original Matter (Chaos, the Unity, Uroboros). The Moon Force embraces and embodies the Female Energy, the Water, the Dragon. This is a Transformation Energy, the Change, the Continuing Mutation, a Wild and Savage Force. While the Solar Dimension is the Dimension of "Being", the sub-lunar one is the Dimension of "Becoming". At this level, the Sun expresses the symbolic color of Red, the Fire (but as flamma non urens). 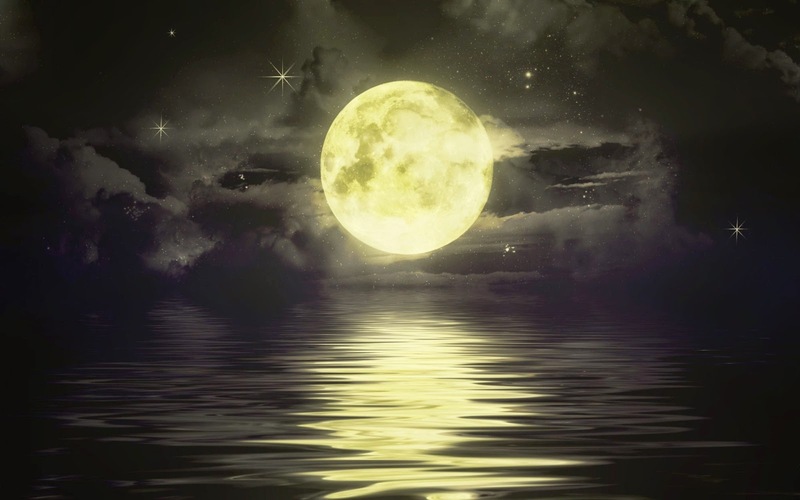 The Moon, at the same level, expresses the symbolic color of White, the Light, the Knowledge. 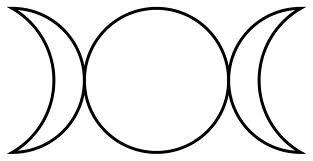 The triad of the Male Deities is placed above (Uranian) and symmetrically in opposition to the Female Triad (below, ctonia, infera) having at the centre the Sun. The result is a spiral path (upward-downward) moving from Saturn and arriving in the Sun and viceversa. Thus the Moon is the first step in the infernal stage of the cosmic cycle as wild dissolving force (solve) freeing energy. In the Commentarium in Somnium Scipionis Macrobius describes how Saturn (ratiocinatio) is dissolved in the Moon or how the logic conscience sinks in the vital energy. Being the Moon "Magical Light" ("Shining Light in the middle of the Night" according to Apuleius), she is a Light "giving Life": she is White, blossom, Life (just note the importance of the Moon in agriculture...). For these features, the Moon is symbolized by a Virgin being in the same time "Mother" because she gives and turns to Life. She is also a "tide", a "Stream" but, above all, "The Flowing Flow"
The Moon is represented by a White Stone (resurrection) named Diana becoming Silver - the Living Silver (The White Rose). This symbology (extremely briefly and superficially described above) is completely translated into the Divine Dimension of Diana (in particular Diana Nemorensis and the ritual of the Rex Nemorensis). Diana is a virgo ("force not blocked by constrains"); she is a wild energy in fast and continuos movement (she is "always distant"). She gives life and death. Diana is symbolized by a white hind and by a deer whose antlers with 7 branches represent the Lunar Tree/The Tree of Life. Diana is also symbolized by the Bow representing the Crescent Moon. The fact that Diana can embrace a so complex symbology (as all the Deities after all) should help us in understanding how in the past these issues were well known and shared. A greater part of this knowledge (as co-shared community heritage) has been lost and today it is likely to be preserved by just few individuals. At the same time, it shows how complex the Traditional Roman Spirituality can be, going beyond some simpler rites, and how articulated (in ritual and symbolic terms) the traditional Pantheon can be. It means that a deep and continuing study represents an essential step in the religious practice. Being a cultor/cultrix is not folklore, just burning some incense sticks or wearing historical clothes. There's therefore something more and maybe something more difficult. 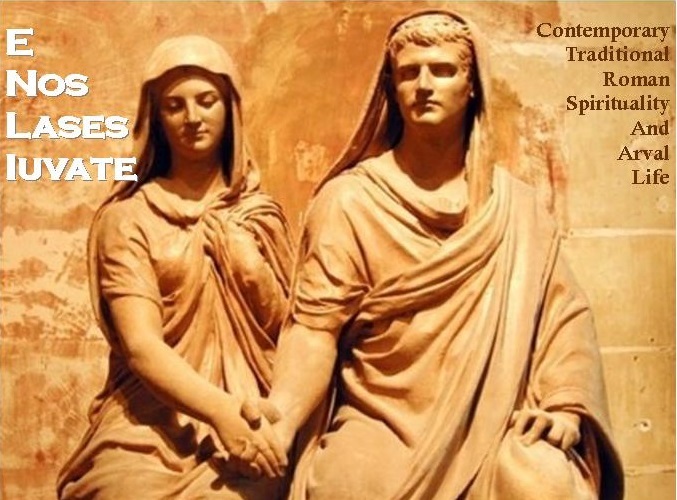 The Traditional Roman Religion is a Via and thanks to an adequate study, the ritual practicing, the Virtus and personal discipline, martial arts and meditation can be possible to master the Via following the Ancestors' example. Con queste parole Marsilio Ficino (1433-1499) riporta questo bellissimo Inno Orfico. Ficino, uomo del Rinascimento e grande esperto di Ars Regia, ovviamente non si riferisce al "satellite della Terra", ma ad un ente metafisico di grande importanza, valenza simbolica e religiosa. 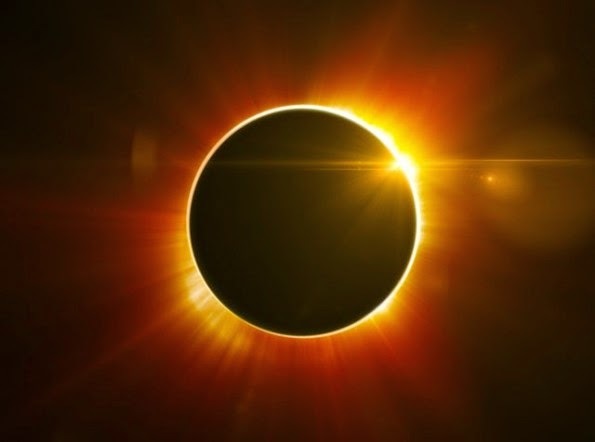 Come già superficialmente accennato per quanto riguarda il Sole, lo stesso si può dire della Luna per la quale esiste un'antica teologia e teurgia. Mentre infatti il mese di Luglio è interamente focalizzato sul Sole (Apollo), il mese di Agosto è interamente incentrato sulla Luna (Diana) e sulla sua estremamente complessa simbologia e profondo significato. E' estremamente difficile fornire delle spiegazioni relative a questa teologia e teurgia lunare (e del resto io stesso posseggo delle conoscenze molto limitate), ma alcuni accenni sia pur brevi e superficiali possono aiutare a comprendere non solo la valenza della Luna nella Religione Tradizionale Romana, ma anche gran parte del Culto che deve essere tributato a Diana, fulcro di questo importante mese del calendario sacro. Ritengo che un cultor ed una Cultrix degni di questo nome debba avere una sia pur minima conoscenza di questa complessa materia, come del resto di quella legata al Sole: ogni approfondimento può essere effettuato facendo riferimento ad un qualsiasi Augur (che per definizione possiede una conoscenza in materia molto più approfondita delle mia). La Luna fa parte della Dualità Fondamentale (Sole - Luna) che deriva dalla Materia Originaria (il Tutto, il Caos, Ouroboros). La Forza Lunare concentra in sè l'Energia Femminile, le Acque, il Drago. Si tratta di un'Energia di Trasformazione, Cambiamento, Mutazione Continua, una Forza Selvaggia; mentre la Dimensione Solare è una dimensione dell'Essere, quella sub-lunare è la dimensione del Divenire. Il Sole esprime a questo primo livello, il colore Rosso, il Fuoco (ma come flamma non urens). La Luna, a questo medesimo livello, esprime il colore Bianco, la Luce, la Sapienza. La triade delle divinità maschili si trova collocata simmetricamente a quella delle divinità femminili con al centro il Sole. Si determina quindi un percorso a spirale (ascendente-discendente) che parte da Saturno e arriva al Sole e viceversa. La Luna quindi è il primo stadio infero del ciclo cosmico (la prima spirale in basso del serpente simbolico) come forza selvaggia dissolutrice (solve), liberatrice di energia. Nel Commentarium in Somnium Scipionis Macrobio descrive come Saturno (la ratiocinatio) si dissolva nella Luna ovvero la coscienza logica sprofonda nell'energia vitale. Poichè la Luna è "Luce Magica" ("Luce rilucente in mezzo alla Notte" secondo Apuleio), essa è Luce che Vivifica: bianco, fioritura, vita. Questa Luna è raffigurata da una Vergine che è anche Madre poichè dà la vita, ma anche da una "corrente", come "flusso fluente". La Luna è simboleggiata da una Pietra Bianca (resurrezione) che viene denominata Diana che si fa Argento (la Rosa Bianca). Come al Sole corrisponde l'Albero del Sole o Albero della Conoscenza, allo stesso modo alla Luna corrisponde l'Albero della Luna o Albero della Vita. 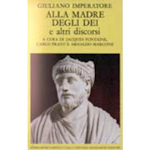 Questa estremamente sintetica e superficiale simbologia si ritrova completamente nalla figura divina di Diana (in particolare il culto di Diana Nemorense). Essa è infatti una virgo ("forza non stretta da vincoli"), è un'energia selvaggia in veloce e continuo movimento (sempre lontana). Essa dà la morte (solve), ma dà allo stesso tempo la vita (rinascita). Diana è simboleggiata da una cerva bianca e da un cervo le cui corna a 7 ramificazioni simboleggiano l'Albero Lunare/Albero della Vita. Diana è inoltre simboleggiata dall'arco che rappresenta la falce di Luna. Il fatto che questa Dea racchiuda in sè una così complessa simbologia ci aiuta a comprendere come gli Antichi avessero una conoscenza molto approfondita di queste tematiche, una conoscenza che in gran parte è andata perduta come patrimonio condiviso di una comunità. Allo stesso modo si comprende anche quanto complessa possa essere la Spiritualità Tradizionale Romana e l'articolazione rituale-simbolica di tutto il suo Pantheon. Questo significa che uno studio continuo ed approfondito costituisce un momento essenziale della pratica religiosa tradizionale. Non si tratta infatti di bruciare dell'incenso o indossare degli abiti pittoreschi: la Religione Tradizionale Romana è una Via e con uno studio adeguato, la pratica rituale, la Virtus e la disciplina personale, le arti marziali, la meditazione è possibile padroneggiare una simile Via e seguire l'esempio degli Antichi. Diana is defined as "Always Distant": she is a non-urban Goddess because she represents the sacralization of woods, forests and wild places.